Through masterfully crafted jewelry, Energy Muse attempts to educate and reconnect the world with ancient wisdoms and healing properties of crystals. The inspiration for their pieces draws on principles of empowerment, hope, and healing. 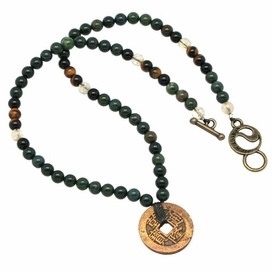 Each specially handcrafted item serves as a unique tool to assist you in reaching your inner power and manifesting your desires. All Energy Muse jewelry is handcrafted in the U.S., with each piece purified, aligned, and activated in a sacred healing room for a minimum of 48 hours. Co-founders Heather Askinosie & Timmi Jandro created Energy Muse as a unique lifestyle, which could incorporate their jewelry. As a result Energy Muse has reached a diverse audience of people. Actors, writers, professional athletes, executives, students and many more who have found the healing effects of purified crystal jewelry to be life changing. Energy Muse transcends what one might think of jewelry and has instead become a lifestyle of wearable energies.